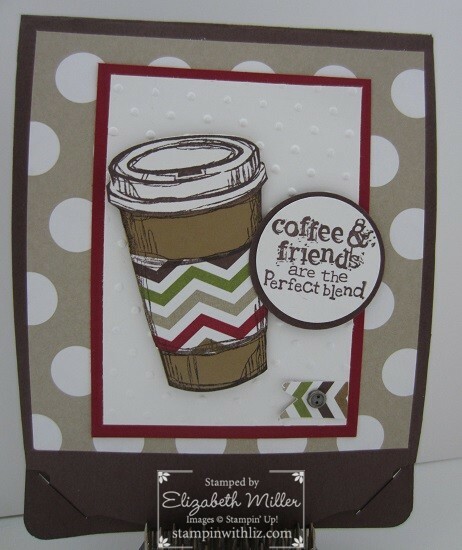 Are you a coffee lover or have a group of friends that are? If you are nodding your head yes, then this is a perfect little gift for your special friends. I used the Season of Style DSP found on page 23 of the Holiday Catalog. I love this paper as it is not screaming Christmas and can be used for anything. I love when Stampin’ Up! does that, don’t you? Are you wondering about that little gift card pocket? I used the smallest of the Envelope Liners Framelits Dies. How freakin’ awesome is that?